In developing countries that lack electricity or the funds to buy expensive machines, taking care of laundry the old-fashioned way requires an enormous amount of time and effort. That’s why Alex Cabunoc and Ji A You created the GiraDora – a combination washer and spin-dryer that is powered by a foot pedal. At only $40, this ingenious contraption is an inexpensive way to help break the cycle of poverty in many disadvantaged communities. 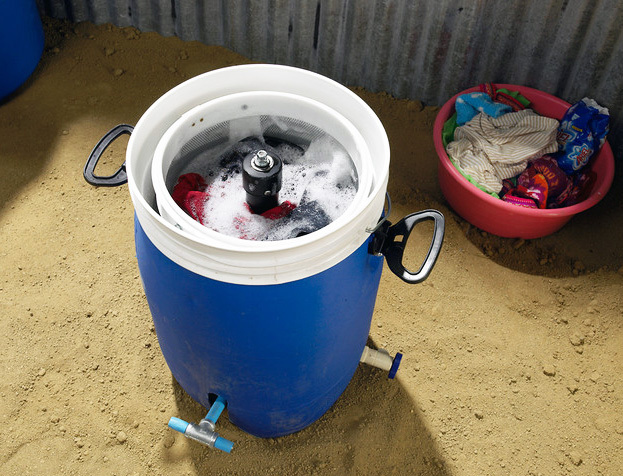 Designed specifically for those with the least income living in the poorest nations, the GiraDora hopes to ease the burden of washing clothes – a chore that can take nearly 6 hours a day, 3-5 days a week. 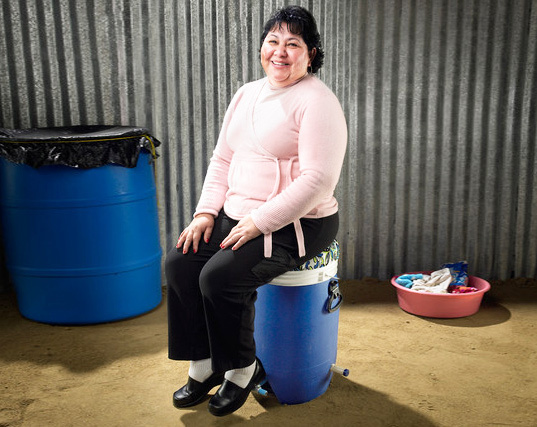 The portable plastic tub can be filled with soap and water before a lid is placed on top, acting as a seat. Then, all the user needs to do is rest on the washer, and pump the spring-loaded foot pedal. This ergonomic design alleviates back pain and chronic wrist strain from scrubbing and wringing clothes and leaves the hands free for other tasks. Loads of clothing can also be washed at one time instead of having to scrub individual articles, which uses less water and overall effort. In addition to avoiding health problems associated with physical stress and mold growing on wet fabric, the GiraDora can also help generate income through providing laundry services, rentals, and direct sales. The GiraDora is currently being field-tested in Peru, and there are plans to introduce it more widely into South America and India. The project has been recognized by both the Dell Social Innovation Challenge, and the International Design Excellence Awards. My washmashine is broke, and I wait 40 days for servis, and I need one... whrere I can order one of this? hi, I love this washer and would love to buy one. where can I purchase one in the US? I love this! I am trying to reduce my dependence on electricity and would love to have one of these. where can I buy one in the US? WHERE CAN I GET ONE? Stop teasing us and sell some already. Good day! i would like to ask if we are going to order here in Philippines how long i will going to wait for the shipping of the product? and how much would it cost? Your answer is much appreciated. Thank you. I would gladly buy two, one for me and one to donate, if I knew where to buy it. Hello. When will the GiraDora Washer be available and where can it be purchased? Thank you. I would be willing to buy 2 and pay for another to donate to someone that needs one too! can i buy one. i dont have the money for a washer and dryer and i have a really hard time washing clothes and things in the tub. i live in texas. im about to have a new baby with cloth diapers so ill really need this. I'd love to have one of these. At $40 (probably a bit more in CDN) I would even buy one for myself and one for a mission project of some sort. Good question! They aren't available for sale but perhaps one day the plans will be made available so you can make your own! How do i get one of these GiraDora Washers? this is fantastic -- you are a great inventor! Now what do you need to get this thing going?? I bet there might be some folks willing to help you a bit - I can't do much as I am retired, but I do want to help... Reading the remarks below - You have our interest! Keep doing the great things you are doing! Let us silly folks know if we can help! Even if it is $10.00 here or there -- let us know! Many of us want one!!! I too would like to buy one. Maybe a program can be started where Energy conscious people in first-world countries pay just a bit more (maybe $60 each instead of $40) so the extra price we pay can contribute to sending these to poorer countries for 1/2 price or even make some of them free. How soon before this project comes to market? rising hydro cost will make this essential - great idea. I life off grid in a wet humid climate. I would love to have one of these that I can wash and dry laundry instead of having to go to a laundromat. Are there any plans to make this available in the US? Only 40 dollars? I'll buy one for 80, if you promise to give one for free to a poor person who would really benefit from it. How to order one? I live in Serbia! wish they would sell all over the world just charge a little bit more and use the extra fee to donate to the 3rd world countries to purchase one for the families there. all would benefit the poor in 3rd world countries n ppl who homestead n want to live off grid in the other countries around the world. I live in Belize now, and would love to buy and have others buy this great machine. PLease get in touch with me. How can we buy this? Great and good invention,which is helpful for the poor and downtrodden. i would like to send one to the philippines. I grew up poor in the US. we washed by hand. I'd have loved a device like and I'm sure there are people in the US who would appreciate it now. if it is offered here most will not be able to afford it. please keep that in mind. After reading all these comments, I did some research and discovered a system that is currently in the market, which is readily available, compact and very portable, for more information, follow this link http://thegreenboyzenergy.com might be worth your while. I would be so happy to have one here in the states. I hand wash my clothes myself. Can't afford the laundromat. You guys do a buy one donate one program I'm totally in. Even if its like 80$ I'd save to help someone else in need. Due to typhoon black out for 3 days, I really need it, how could I buy it? I live in the Philippines. Maybe a lot of people need it here. I would really like one myself! Where can I purchase one? WHAT !!! I would love to have one in Jamaica !!! please contact me !!! ASAP !! Don't forget, there ARE low income families in the U.S.A. who could use something like this to wash clothes who cannot afford the laundromat. So.... WHY is this NOT being sold in the US??? Put in on Ebay sheesh. How is that so hard? I\'ve been interested in this thing ever since it was first announced, which was maybe three years ago. It\'s very clever and potentially useful. Unfortunately, the only thing it is so far is an idea and too much hype. There\'s no web site for it, no company behind it. Just a bunch of students with a good idea, a facebook page, and a desire to have this same teaser information reprinted on every cool design and eco site on the web. Unless they can find a company who will back it, capitalize it and work on it full-time, it will remain just a good idea. They should cease all efforts to get it in the news until they\'re ready to deliver, because it\'s just irritating to those of us who are ready to buy and support it. I'm in NYC. Would also LOVE to try this. Any chance of getting it here in the US? I would love to try this or even buy it. Please let me know. In developing countries that lack electricity or the funds to buy expensive machines, taking care of laundry the old-fashioned way requires an enormous amount of time and effort. That's why Alex Cabunoc and Ji A You created the GiraDora - a combination washer and spin-dryer that is powered by a foot pedal. At only $40, this ingenious contraption is an inexpensive way to help break the cycle of poverty in many disadvantaged communities.